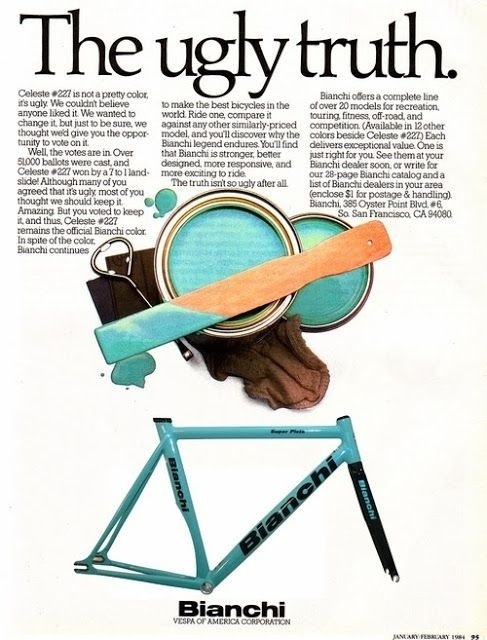 Having recently reviewed my first-ever Bianchi I must say this old advert made me smile. Celeste #227 isn’t my favourite colour, either. Nice bikes though. Heh. I just bought my first Bianchi – though it’s not the full-celeste. It’s carbon, white graphics with celeste highlighting. I think it’s kinda beautiful, though my GF doesn’t agree.